Completely updated for 2016, topics include seamanship, pilotage, tide tables, safety procedures, navigation tips, radio, lights, waypoints, weather forecast information, communications, Mayday and distress procedures. The spiral binding allows the Almanac to be opened flat on the chart table and the large type size and clear layout makes information easy to read even in adverse conditions. 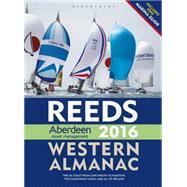 It is the complete guide for both Irish and Scottish mariners as well as those cruising the UK west coast.